I call this “slapdash” because it’s made almost entirely with things that are already cooked — it’s leftovers, essentially, whacked into a casserole and made all shiny and new. It doesn’t have to be that way; you could certainly start the recipe by cooking up some ground lamb or beef with the onion while it’s sauteing. But if you use leftovers, this is a resourceful and unbelievably easy way to get a second hot, healthy meal into the family with almost no extra effort. This is what the pie looks like before you’ve browned it. To assemble the shepherd’s pie, saute the onion in butter in a large skillet until softened. Add the carrots, celery, and rosemary; cook for about 5-7 minutes, until the vegetables begin to soften slightly. Season with salt and pepper; sprinkle with flour. Mix until the vegetables are totally coated with the flour. Cook for about 1-2 minutes, then add the wine or beer and stock. Bring to a boil, reduce the heat, and simmer for another 5 minutes. 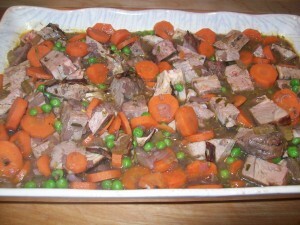 Add the cubed lamb and peas, stir to combine, and remove from the heat. In a large bowl, beat the eggs and leftover mashed potato together until thoroughly combined. 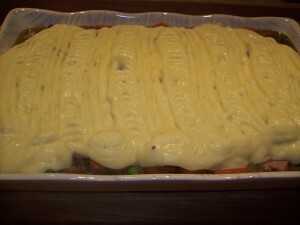 Pour the lamb mixture into a 9×13 casserole dish, then spread the mashed potato mixture evenly over the top. I always leave a slight border around the edges so you can see the filling beneath, but that’s entirely optional. If you’re baking the casserole right away, put it in a 400 degree oven for 15 minutes, then turn on the broiler and broil for 3-5 minutes or until the top begins to brown. If you’ve made it in advance and are reheating it, cover with foil and bake at 400 degrees for 30-35 minutes, then remove the foil and broil it for 3-5 minutes to get the potato topping browned. And this is what’s underneath the potato topping.